We pursue promising science and advanced technologies. Antigen binding fragments bound to IL-12. Colors represent different parts of the molecule. 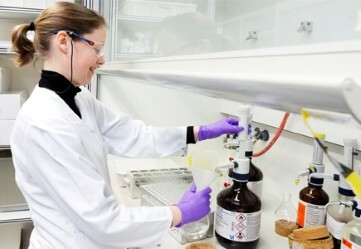 Novel peptide platforms comprise transformational peptides in mono-specific or multi-specific formats that can be used to enhance potency and selectivity, as well as extend half-life. The Gene Therapy discovery group was established to discover nucleic acid-based therapeutics that have the potential to address significant unmet medical needs. The Cell Therapy discovery group was established to discover cell-based therapeutics to address significant unmet medical needs. These products are comprised of living cells, which can be delivered in a targeted manner to treat disease. The lead Cell Therapy candidate for Janssen R&D, now in full development, is a cell-based product that is delivered into the subretinal space to treat advanced dry age-related macular degeneration (geographic atrophy). A group dedicated to the development of alternatives to antibodies, Centyrex, was established to explore the potentially transformational properties of alternative scaffolds. Centyrins are small, simple proteins in an emerging class of therapeutic proteins with exceptional physical properties, and with numerous differentiated applications compared to monoclonal antibodies and peptides. This group is also responsible for generating therapeutic candidates based on the fynomer platform.